The Classic Fusion is a black sheep in the Hublot family. It is generally more refined than the Swiss manufacturer's other watches, though it maintains the typical porthole design. Top watches feature a tourbillon and minute repetition. More refined than the Big Bang and more modern than the Classic – this is how you might describe the Hublot Classic Fusion. The design of this luxury watch is inspired by early models from the 1980s and stays true to the manufacturer's fusion concept. One example combines classic leather straps with carbon or ceramic cases. What's more, it bridges the gap between the vintage pieces of yore and the distinctive sports watches of today. The Classic Fusion suits almost any dress code, be it casual or black tie. The Classic Fusion Tourbillon Cathedral Minute Repeater is one of this collection's top models. This timepiece features a tourbillon and a minute repeater, meaning it is extremely accurate and can express the time acoustically. These high-end timepieces are available in titanium, carbon, or King Gold. King Gold is a red gold alloy developed by Hublot with an intense red color. The Classic Fusion Automatic is the collection's simplest and most affordable model. With cases ranging from 33 to 45 mm in diameter, this timepiece is a great choice for both men and women. Hublot constructs these watches out of ceramic, titanium, or King Gold. Some models use a mix of titanium and King Gold or ceramic and King Gold. 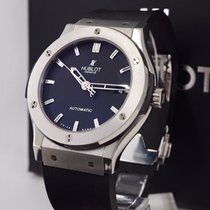 How much does a Hublot Classic Fusion cost? A 42-mm titanium Hublot Classic Fusion costs around 5,500 USD in mint condition. Pre-owned examples are somewhat less expensive at 4,800 USD. Thanks to its gray sunburst dial, the Classic Fusion Racing Grey feels especially elegant. Models with a blue or green dial are more eye-catching and trendy. The alligator leather strap is available in matching gray, green, or blue tones. If you'd like to call a 45-mm automatic Classic Fusion your own, plan to spend a bit more. The Classic Fusion Titanium Blue costs almost 6,000 USD new and 5,500 USD pre-owned. A new, King Gold model goes for around 17,900 USD, while a pre-owned piece demands 15,000 USD. Plan to spend about 7,500 USD on a never-worn Classic Fusion Ceramic Blue. The 33 and 38-mm versions are even more affordable. Titanium models cost around 5,300 USD new. Due to their size, these two variants are geared more toward women. The Hublot Classic Fusion Diamond has numerous diamonds on its bezel, making it a particularly luxurious women's watch. However, the precious gems also make these watches much more expensive: Mint-condition women's watches in titanium with a quartz movement sell for at least 7,300 USD. Those in King Gold with diamonds cost about 17,500 USD. The Classic Fusion collection also contains chronographs. These 42 and 45-mm timepieces have a more masculine feel. In terms of case material, you can choose titanium, King Gold, ceramic, or bicolor versions. The price for a never-worn, 45-mm Classic Fusion Chronograph in titanium comes in at over 8,500 USD. Be sure to set aside around 24,000 USD for a new example of the Classic Fusion Chronograph in King Gold. The Hublot Classic Fusion Aerofusion is another of the manufacturer's most desirable luxury watches. Its most striking feature is the skeletonized movement, which you can view through the sapphire glass dial. This 45-mm watch comes in titanium, ceramic, or King Gold, either with or without diamonds. The price for a never-worn titanium model sits around 11,300 USD. Pre-owned pieces are about 1,200 USD less expensive. Gold versions with a King Gold link bracelet go for just over 40,200 USD in mint condition. You'll need about 13,500 USD for an Aerofusion in ceramic. One of the collection's design highlights is the Hublot Classic Fusion Aerofusion Chronograph Orlinski . The watch manufacturer developed this timepiece's faceted appearance together with Richard Orlinski, a French artist famous for his sculptures of wild animals. The blue ceramic edition is particularly hard to ignore and costs over 18,700 USD in mint condition. Those made of black ceramic or titanium fall into a similar price range. 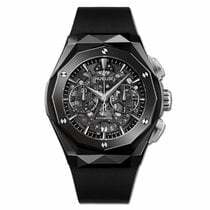 At 29,200 USD, the King Gold version is the most expensive Aerofusion Orlinski. The Hublot Classic Fusion Tourbillon Cathedral Minute Repeater is easily the most complicated watch in this series. Thanks to its minute repeater, it can express the time acoustically on demand. The tourbillon at 6 o'clock guarantees its exceptional accuracy. The case of this 45-mm timepiece is available in titanium, King Gold, or carbon. Prices range from around 222,000 USD for titanium models to 251,000 USD for those in red gold. Carbon versions sit in the middle at 234,000 USD. The Classic Fusion Tourbillon comes without a minute repeater and is therefore much less expensive. Titanium models cost slightly more than 35,000 USD. Set aside about 43,300 USD for a King Gold version. The addition of a chronograph causes the price to jump to around 64,300 USD. The porthole design is the characteristic feature of the Classic Fusion. It is also a trademark of Hublot, as its name means 'porthole' in French. The wide bezel and its six screws resemble those of other luxury sports watches, such as the Royal Oak from Audemars Piguet. The Classic Fusion is offered in gold, titanium, or ceramic. The sizes vary: It's available in 33, 38, 42, and 45 mm. The collection has both men's and women's models, although not all variants are produced in each size. The Power Reserve, for example, is only available as a 45-mm version. Standard versions with three central hands and a date display at 3 o'clock are normally produced in a wider variety of sizes. Hublot offers the Classic Fusion as a 42-mm or 45-mm chronograph with a mostly closed dial. These versions have two subdials, one at 3 o'clock and the other at 9 o'clock. The date display is located at 6 o'clock. Also available in 42 and 45 mm is the Aerofusion Moonphase . As its name suggests, it has a moon phase complication. It also features a skeletonized dial and movement, giving you a wonderful view of the watch's internal mechanics. The Ultra Thin (42 mm and 45 mm) has been part of the Classic Fusion collection since 2012. This three-hand watch does without any complications and a date display. The seconds hand is decentralized, located at 7 o'clock. The Ultra Thin is exceptionally thin, coming in at just 2.9 mm. It has a skeletonized movement and dial. You can also view the movement through the dial on the chronograph version of the Aerofusion. Like the Power Reserve, this watch is only available in a 45-mm size. The Power Reserve's dial isn't skeletonized and features a power reserve display on the top left as well as a small seconds at 6 o'clock. Hublot uses calibers under their own name in the Classic Fusion. Some movements are originally from other manufacturers that specialize in calibers. For example, the HUB1112 is based on the Sellita SW300-1. The HUB1143 is an ETA 2892-A2 with a chronograph module from Dubois-Dépraz. The HUB6310 and the HUB8001, on the other hand, are in-house calibers with a tourbillon. The 1602 powers the Classic Fusion Power Reserve, which has an impressive 8-day power reserve. Italian watch designer Carlo Crocco founded Hublot in 1980. He came up with the previously mentioned fusion concept by combining a gold case with a rubber strap. In 2008, Crocco sold his Hublot shares to the luxury goods concern Moët Hennessy Louis Vuitton SE (LMVH). Another important person in the company's history is Jean-Claude Biver. Formerly the CEO of Omega, he became the CEO of Hublot in 2004. Biver was responsible in large part for the increase in demand for Hublot. One year after he became CEO, Hublot introduced the Big Bang. It won many prizes and transformed Hublot into one of the most well-known Swiss luxury watch manufacturers. The Classic Fusion joined the Hublot family of products in 2010. It was designed to appeal to people who find the Big Bang too conspicuous. By wearing a Classic Fusion, you're displaying a sense of taste, be it on the golf course or in the office.